How about some old Les Paul stuff? You can’t go wrong. 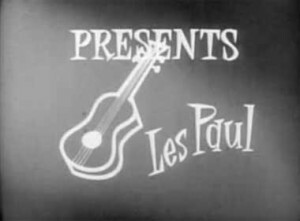 The Les Paul and Mary Ford TV Show (there are 10 or so of these). Mary Ford is always petting the plant or spreading avocado on bread or something suitably domestic while she sings. If this sort of thing sounds good, I recommend the The Best of the Capitol Masters: 90th Birthday Edition [amazon]. I just bought it and, boy, am I happy. Les Paul apparently invented multi-tracking and did some incredibly cheezy stuff where one guitar is dubbed doubletime, very fast in a high register. More at my URL. How about Scotty Anderson. Good heavens. I realise, here, now, for the first time, that ‘Nola’ was used as the theme tune for the Children’s BBC animated ‘Paddington’ series (not Les Paul’s version, but still). That’s somehow very lovely to know. I just turned the TV on right now and found myself watching the beginning of a 90 minute Les Paul biography. Synchronicity or what? Yeah, while I was making the links, I was noticing all the Chet Atkins goodness. Lester and Chester. Maybe next week I’ll do Chester. One last link. I was playing Les Paul’s “Brazil” and Zoë (age 7) asked: is this music from the future or something? I’m more of a Link Wray fan but cool. Thanks.